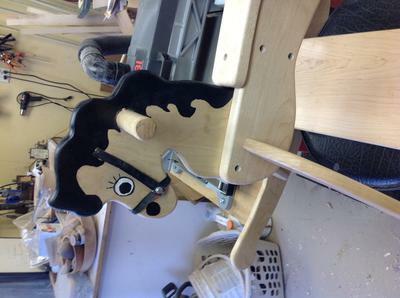 Larry from Tucson, Arizona, made this delightful rocking horse for his granddaughter who lives in Boston. This is where I am now. Solid hard maple wood. The plugs on the rockers are walnut. I'm going to take it apart and travel to Boston with it in my suitcase. 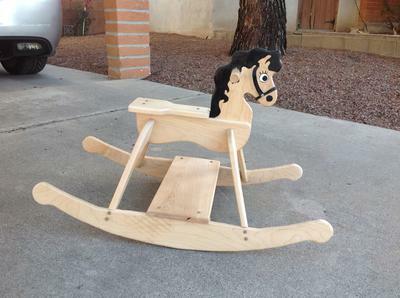 My son and I will assemble it there for my grand daughter. Thanks for the great plan. It was made from one 12'X 6" 8/4 board. 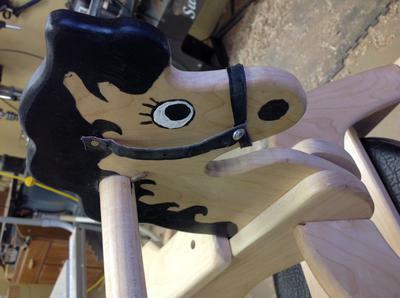 I just finished the pony today. I'm taking it to Boston for my Grand daughter's birthday present. 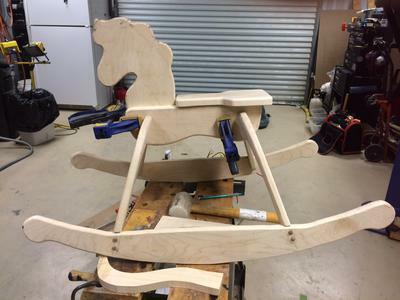 I did not glue and screw the major parts yet. It has to fit in my suitcase for the flight to Boston. My son and I will do the final assembly there at his house. I made the halter from a racquet ball racquet grip, some pop rivets, and two brass nails. The paint is a water based paint. I turned the plugs to hide the screw heads on my lathe. They are maple and the darker ones are walnut.